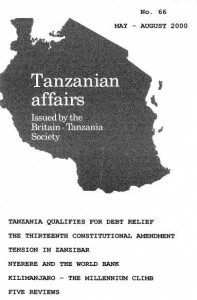 Tanzania has qualified for debt relief under the Heavily Indebted Poor Countries Initiative (HIPC) of 1996. This news was revealed by World Bank Country Director for Tanzania, James Adams, on April 7. He was quoted in the Dar es Salaam Guardian as saying that Tanzania would, effective from April 2000, start to benefit from a $2.2 billion debt relief programme extended by the IMF and World Bank/International Development Association (IDA). Tanzania’s eligibility, he said, was a recognition by the international community of the progress it had made in implementing economic reforms and achieving poverty reduction. The $2.2 billion debt reduction would reduce the current total of $6.4 billion due to the international agencies and ‘Paris Club’ creditor nations participating in the relief operation to $2.6 billion. Some $2.4 billion of this debt was due to the International Development Association (IDA) the concessional lending arm of the World Bank, $294 million to the IMF and $20 million to the World Bank itself. Tanzania currently spends some 35% of its annual recurrent income to service its foreign debt which totals altogether $8.6 billion. Several other creditor such as China and Eastern Europe are not included in the debt relief operation. However Tanzania would have to implement several conditions (or ‘conditionalities’ as they are described) before the bulk of the relief would be available. The country would have to implement a participatory poverty reduction strategy, maintain a stable macro-economic environment, implement measures specifically related to poverty reduction and get confirmation from other creditors that they would participate in the debt relief operation. According to Adams the IDA debt relief of $1.2 billion would be spread over a period of 20 years and would cover 69% of the country’s debt servicing costs. The IMF debt relief of $152 million was expected to be delivered over 10 years and would on average cover 58% of the debt service obligation. There were two stages in the debt relief process -the ‘decision point’ when a country became eligible for relief which started now and a ‘completion point’ likely to be in 2001 after the conditionalities had been met. At ‘completion point’ the settlement was intended to bring about a level of debt which could be regarded as sustainable. Between now and the completion point, Tanzania would receive interim relief amounting to $26.5 million immediately and about $80.7 million in the immediately following years. After ‘completion’ Tanzania should be able to save $100 million annually. Before the latest decision an assessment team from the US General Accounting Office which visited Tanzania in February had praised the arrangements being made by Tanzania and its sound plans for the use of funds from the HIPC initiative. They described Tanzania’s plans as better than those of Nicaragua, Bolivia and Uganda, countries already visited by the team. They intended to portray a positive image of Tanzania so that it would get priority in the debt initiative. On February 16 it had been announced that Britain, whose Chancellor of the Exchequer Gordon Brown has been in the forefront of negotiations to relieve the debt of poor countries, would support the inclusion of Tanzania in the list of countries to receive debt relief. The subject of debt relief was the main theme of a full day international tribute to Mwalimu Nyerere organised by Jubilee 2000, the Tanzanian High Commission and the Africa Centre in London on April 19. Speaker after speaker condemned the World Bank/IMF and the Western powers and demanded total debt relief for third World countries. The situation was frequently described as a new form of slavery. Mwalimu’s daughter Rosemary said that her father had always insisted that Tanzania’s debt was unpayable. Tanzania was spending $4 on debt servicing for every one dollar on education and $9 on debt servicing compared with one dollar on health. The debt was equivalent to $267 for each individual in the country even though the average annual income of Tanzanians was only $210. Jubilee 2000 Senior Research Officer John Garrett told ‘Tanzanian Affairs’ that the real worth of the new debt relief was much less than indicated above and that the figure of $100 million per year was deceptive because much of the relief was on debt which could not be repaid -described as ‘unpayable’ debt. He estimated that the actual debt relief would amount to a probable drop in debt service payments from the present figure of $162 million p.a. to $150 million p.a., a reduction of some $12 million (7%) which would be nothing like enough to enable the government to significantly increase its expenditures on poverty reduction. However, a number of creditor countries were now giving 100% relief or were likely to do so in the near future. The recent sale of IMF gold would make only a small contribution to debt relief for Tanzania as it had to be spread over many indebted countries. At a reception given by Tanzanian High Commissioner in London Dr. Abdul Shareef, he and Prime Minister Frederick Sumaye, who had been the opening speaker at the Jubilee 2000 meeting, explained to ‘Tanzanian Affairs’ the apparent contradiction between the World Bank’s interpretation of the proposed relief and that of Jubilee 2000. They said that Tanzania had never been able to pay the $1 billion p.a. of debt service charges that it should have been paying. It had been averaging only about 20%. Much of the difference had been paid through bilateral grants from creditor nations including the UK but Dr Shareef said that promised grants were not always received. The World Bank’s figures were based on a formula related to the start of the IllPC in 1986 when Tanzania’s debts were around $5 million and assumed that full payments were being made by Tanzania. Dr Shareef said that, provided that nothing went wrong (he mentioned acts of nature such as cyclones or severe droughts) and that Tanzania a) continued to do as well or better economically as it was doing now, b) investment continued at the present pace, and c) the Tanzania Revenue Authority continued to collect adequate taxes then, in two or three years time, the country would begin to receive about the sum which Jubilee 2000 had estimated ($12 million p.a.) and that the 80% service charges which Tanzania had not been able to pay would be written off over a period of 20 years. He added that at the last meeting of the ‘Paris Club’ Tanzania had asked for 90% of the debt to be written off. Were this to be done the country would continue to pay what it was paying now provided that donor grants continued as at present. The High Commissioner pointed out that Tanzania’s annual recurrent expenditure was about $110 million which meant that the debt relief represented only a very small contribution in real terms. He added that the $12 million per annum of relief was for a country with a population of some 30 million people. He likened the debt initiative to the situation in a hospital where a patient is on his deathbed, extremely ill and with a lot of pain. The doctor, instead of giving a blood transfusion, continues to take a pint of blood from the patient every month. He gives the patient two aspirins a day to relieve the pain! A Commission on Constitutional Reform under Judge Robert Kisanga began working in July 1998 and published its report on December 4 1999. It said that about 600,000 people had participated in the exercise. It had been asked to look at some 20 controversial constitutional issues. The 1977 Constitution has been amended many times -its initial 95 provisions have increased to 152 through various amendments over the years -and, following the Commission’s conclusions, the government proposed a number of changes, collectively known as the 13th Amendment to the Constitution which formed the basis of a Bill presented to Parliament. The most important issue facing the Commission was the future structure of the Union on which strong views are held. There were three alternatives -Tanzania to be ruled by two governments (one for the Union and one for Zanzibar) as at present, or by three governments (for the Union, the mainland and Zanzibar as recommended by many mainland MP’s and academics) or by one unified government ­something which is unacceptable to Zanzibar. The Commission appeared to be sympathetic to the idea of three governments but in its report stated that the overwhelming number of people they met wanted the present two government system to continue. President Mkapa and his ruling party, the Chama Cha Mapinduzi (CCM) reacted quickly on the issue and made it clear that the present system would continue. Vice-President Dr Omar Ali Juma, in several speeches in Kilimanjaro Region, criticised critics of the present two­government system because they failed to indicate how the Union could be sustained under a three-government system. g) the policy of socialism and self-reliance would remain as part of the constitution. Other clauses would ensure that tax evaders would not be allowed to stand for election and, in order to save money on by-elections (they cost Shs 200-500 million on average) these would not be held within one year of the following general election. The Tanzania Law Society described the changes as premature, partisan and inadequate. The Society were in support of many of the objections raised by the opposition and particularly objected to the creation of a ‘Human Rights Commission’ under the Office of the President. The Society said it should be an independent body. A coalition of 20 civil society bodies and NGO’s calling itself the ‘Citizens Coalition for a new Constitution’ described the proposed changes as glaringly undemocratic and meant to ensure an easy landslide victory for CCM in the forthcoming elections. A leading article in the Guardian headed ‘Legislators compromised democracy in Dodoma’ said that what was interesting about the debate was that what some of the CCM legislators were propounding in the august House was the complete opposite of what they were expressing (probably what they really believed) outside parliament. ‘We are baffled’ the leader writer wrote ‘by the honourable MP’s decision to endorse proposals which in effect may give us an unpopular president elected with only 35% ofthose people who vote’. Those in favour of the amendments said that Tanzania needed a strong presidency and the opportunity for him to appoint ministers who were not politicians and also to have more women MP’s. MP Juma Akukwete told ‘Tanzanian Affairs’ that for him one of the most important factors was the expense of the election process. The two-phase system used in the recent Senegalese election, under which a second ballot is held if no candidate wins 50% of the votes, would be excessively expensive for Tanzania. Other supporters of the changes, particularly for the nomination of 10 MP’s, pointed out that the British Prime Minister nominates people to sit in the House of Lords. The Bill was passed after three days of debate on February 10 by 213 votes against 49 -well over the two thirds majority needed. Three opposition parties ~ CUF, UDP and CHADEMA -indicated that they would sue the government regarding the way in which the 13th Amendment had been passed. On the issue of which article of the constitution would be used to determine the procedure for amendment the Speaker decided that it would be Article 98(lA). This meant that the matter would be determined by a two thirds majority in the Union parliament only (not in the Zanzibar Assembly). The opposition insisted that it should be Article 98(1B) which required constitutional amendments to be passed by two thirds of both the Union and Zanzibar parliaments. CCM does not have a two thirds majority in the Zanzibar Assembly. The next day however, the Attorney General (AG) refused to sign the opposition’s letter in support of a petition to get the High Court to interpret Article 98 (1A) of the Constitution. He said that Article 98(1A) was correct and needed no further interpretation. The opposition then proposed to use Article 26 which grants the right for any citizen to go to court when they consider that the constitution has been violated. A frustrated John Cheyo said that in other countries the AG would seek such court interpretation. The AG said that if the opposition had been intelligent enough they would not have wasted their time on the matter. Veteran CCM MP and former Prime Minister John Malecela said that the opposition ‘should have known better’. In his response, State House Press Secretary Geoffrey Nkurlu, quoted in the Daily News on February 21, said that the East African had defied the ethics of journalism. ‘By omitting (mention) of the countrywide exercise to collect views from the people, the author deliberately intended to mislead the public, portraying the President as a despot, unpopular … and power hungry who could only win elections by bending the rules …. 92% of the people interviewed by the Presidential Commission supported the simple majority vote; 95% were in favour of the President nominating at least 10 parliamentarians. This measure would enable the president to nominate people from various social groups regardless of their political affiliation’ He pointed out that countries like the USA, UK and Kenya elected their leaders through simple majority vote. The system was cost saving and suitable for a developing country like Tanzania. The opposition was further frustrated when the government turned down its request that political parties should be represented on the National Electoral Commission so as to ensure fairness in its deliberations. The government pointed out that the existing commission was unbiased and had well qualified members who were not allowed to belong to any political party. It was agreed that the election petition bond should be increased from Shs 500 to Shs 5 million to save costs -over l30 petitions contesting the results of the 1995 elections were submitted. The formerly influential opposition party and now troubled NCCR-Mageuzi has fallen further apart amid recriminations about what happened to subsidy funds amounting to Shsl40 million received from the government last year. The party’s youngest MP, 35-years-old James Mbatia (Vunjo, Kilimanjaro) was elected national chairman in February by 251 votes against 202 for the party’s founder and Secretary General Mabere Marando. The new chairman said that the question of the missing funds had been handed over to the police for action. Marando did not contest the election for Secretary General and Mr Polysia Mwaiseje won this post by 52 votes to 30. Then came more bad news for the party. The fiery Dr Masumbuko Lamwai, prominent NCCR party leader in Dar es Salaam, announced that he was leaving the party and begging forgiveness from President Mkapa for all the disparaging remarks he had made about him during his political life. Earlier, another prominent NCCR leader, Makongoro Nyerere, son of the late Mwalimu, rejoined CCM. The other small parties -CUF, UDP and CHADEMA -are trying to agree on a single candidate to face CCM in the October elections. Professor Lipumba of CUF and John Cheyo of UDP, who stood in the 1995 elections, are being mentioned as possible candidates in 2000. The by-election followed some four years of litigation between Premji and Kabourou which culminated in the Court of Appeal [mally nullifying Kabourou’s election as MP in the general elections of 1995. After the results were declared, Kabourou refused to sign the election result forms claiming that the election had not been free and fair. The Field Force had to be called in to control angry CHADEMA supporters and some 80 people were arrested. The by-election gave the first indication of collaboration between opposition parties -the TLP and UDP left the field free for Kabourou to try and defeat the all powerful CCM. There were minor disturbances when the results of the Ubungo and Kibaha by-elections were announced which were also won by CCM. Local elections were held all over Tanzania on November 28 but the results were not published in the English language media and turnout appears to have been very low. CCM claimed to have won 95.6% in villages, 94% in streets and 95% in area elections. Dar es Salaam Regional Commissioner Yusuf Makamba criticised the educated people for not taking part in the local elections. He said that they were responsible for Tanzania having second rate leaders in local government. Dar es Salaam has been divided into three municipalities, the leadership of which will be determined in elections later this year. They are Ilala, Kinondoni and Temeke. This return to democracy follows the closing down on February 1 of the City Commission which is generally regarded as having done a very good job. It took over responsibility for running the city from elected officials four years ago and increased its collection of revenue from Shillings 1.5 billion in 1996 to Shillings 7.4 billion in 1988. This enabled the commission to build 14 schools and renovate 648 classrooms. International and local pressure on Zanzibar for an improvement in the human rights situation there has led to a tense situation in the Isles during recent weeks. The first issue causing tension was whether the Zanzibar Constitution should be changed to allow President Salmin Amour to stand for a third term in office from October. In one of the most difficult decisions they have had to take, the Central and National Executive Committees of the CCM in Dodoma eventually decided at the beginning of March (following an earlier 4-day CCM meeting of CCM elders in Zanzibar which had recommended the change) that the Zanzibar constitution should not be changed. Instead, the matter could be reconsidered after the October elections. After its narrow win in 1975 many in CCM in Zanzibar apparently feared that, without the tough minded and assertive Dr Amour (popularly known as ‘commando’) heading its election list, the party might have a struggle to win in October. This had become a major national issue during February as lawyers, academics and politicians of all persuasions on the mainland said it would be a breach of democracy. Mwalimu Nyerere before he died had made it clear that he was not in favour of such a thing. Union Vice-President Dr Omar Ali Juma (from Zanzibar and believed to have presidential ambitions himself) indicated that he also did not favour Amour’s continuation in office. 45 mainland CCM MP’s in the Union parliament petitioned Amour to shelve the proposed amendment. Then another group of 52 mainland CCM MP’s, including the Deputy Speaker and ten former ministers, censured Amour for his attempts to amend the constitution. Finally, it is believed that President Mkapa and former President Mwinyi brought their influence to bear against the change at the Dodoma meeting. Even though Amour himself chaired the meeting he kept a low profile and insisted repeatedly that he wasn’t himself pushing for the constitutional change. Opposition leaders joined CCM supporters on the mainland in welcoming the outcome. The leading article in the Guardian was headed ‘Cheers CCM’. The East African said that CCM deserved kudos for its decision which would have come as a relief to most ordinary Tanzanians ‘who had seen the question of the Zanzibar constitution built into a crisis of almost umanageable proportions before their very eyes’ . Returning to Zanzibar after the Dodoma debate, President Amour was quoted in the Daily News as saying that the decision had not been bad but had been taken to ‘give time for CCM to look into ways of revising its presidential two-terms policy’. Although the Isles government had all the powers necessary to amend its own constitution, it had been forced to seek prior consultation and the wisdom of CCM on proper ways to carry out the idea. President Mkapa announced a minor cabinet reshuffle on March 2. Minister of Home Affairs Ali Ameir Mohamed changed places with Minister of State in the Prime Minister’s Office (Information and Policy) Mohamed Seif Khatib. Some speculated that the apparent demotion of Ameir, who hails from Zanzibar, was because he was on the losing side on the issue of a third term for President Amour but he denied this. Other aspects of the Zanzibar constitution have also been under debate recently. The Government proposed and the Civic United Front (CUF) opposition opposed a Bill, one of the clauses of which would allow Dr Amour, as a former president, to be immune for life from prosecution for any acts committed while in office. 35 MP’s took part in the debate but CCM failed to get the necessary two thirds majority. The voting was CCM 47 to CUF 24. Some CCM members threatened to take the House Speaker to court for allowing the four CUF MP’s in prison (for treason) to vote. The Speaker explained that the four had written to him to indicate that they were opposed to the Bill. According to the Guardian, on April 18, the CCM majority in the House approved a government plan to reduce the number of constituencies ahead of the elections. CUF complained that some narrowly held CUF constituencies in Pemba were amongst the ones to be removed. On March 24 outgoing Commonwealth Secretary General, Chief Emeka Anyaoku, issued a statement accusing Zanzibar of lack of progress on a range of critical areas of the agreement which had been signed between the two Zanzibar parties on June 9, 1999 (The agreement was published in TA No 64 Editor). He was referring amongst other things to the composition of the Zanzibar Electoral Commission (ZEC), establishment of a credible voters register, equitable access to the public media and reform of the judiciary. Dr Amour later described this as unfair as 90% of the agreement had been implemented. Commonwealth special envoy Dr Moses Anafu arrived in Zanzibar on March 26 for a week in an attempt to get the two parties to fully implement the agreement. Dr Anafu told ‘Tanzanian Affairs’ that the government had told him that they had implemented 30 of the 38 proposals drawn up by the Inter-Party Committee (IPC) set up to implement the agreement and six others needed amendment before implementation. Two had been turned down. Outstanding issues included the reform of the Electoral Commission, the appointment of two additional CUF members to the House of Representatives (the government said that this was difficult as it would mean displacing two CCM members and that President Amour had no powers to do this) and the formation of the committee to examine alleged mistreatment of students and civil servants suspected of being supporters of CUF (the government said that it would appoint an independent assessor instead). Dr Anafu said that few of the proposals needed legislation -only those concerning the reform of the judiciary and the composition of an independent electoral commission were likely to need it and the experts who had been in Zanzibar in connection with the agreement had prepared the necessary draft bills. As this issue went to press it was reported from Zanzibar that the new Commonwealth Secretary General, Mr. Don Mc Kinnon, who had already written to President Mkapa expressing his concern about delays in implementing the agreement, had been invited to visit the Isles. Dr Anafu said that he himself expected be in Zanzibar at the end of April to pursue agreement implementation. He explained that during his March visit he had received assurances from President Amour that the agreement would be implemented in full but that there was no need to set a timetable. Anafu said that Tanzania had always had an enviable reputation because of the peace which had reigned in the country for many years and anything that detracted from this would be a loss for Africa. He had urged CUF to show restraint. He also added that during the negotiations last year, when it looked as though there was going to be an impasse, President Mkapa had intervened as Chairman of CCM, had appointed a negotiating team and facilitated the agreement. He hoped that President Mkapa might be able to do something similar again. The most serious problem between the island and the mainland has for long been the alleged abuse of the human rights of opposition supporters in Zanzibar as exemplified by the insistence of the Zanzibar authorities on pursuing a case of treason against 18 CUF leaders. Most mainlanders are embarrassed by the way in which the accused have been held in jail for two years without trial and by the adverse international publicity given to the case. On January 26 45 CCM Union MP’s called on President Amour to stop the trial. They said it was political and lowered the dignity of the nation. The CCM committee in parliament then stated that this was their personal action and was not a CCM decision. The Dar es Salaam Guardian reported that when the hearing of the trial had resumed on January 19 there were riots outside the High Court in which stones were thrown, tear gas bombs fired and some 70 people were injured. The government’s case was not strengthened by the confusion on its own side. Zanzibar’s Attorney General (AG), the 72-year old Mohamed All Omar, had caused quite a stir earlier when he had said that the treason trial was nothing but politics and that he could not proceed with the case unless eight more top CUF leaders including Vice-Chairman Seif Shariff Hamad and Secretary General Shabaan Mloo were also arrested ­something which could have caused further outcry locally and internationally. The then Union Minister of Home Affairs Ali Ameir Mohamed made it clear that he wanted the trial to proceed without additional arrests. However, on January 25 the Attorney General, having tried without success to persuade the Director of Criminal Investigations and the Police to effect the additional arrests, himself issued a warrant for the arrest of Hamad and Mloo. Both had presented themselves to him two weeks earlier volunteering to be arrested. They later said they had been prepared to die or face life imprisonment. On January 26 however, there was a bombshell. The Attorney General was summarily replaced by High Court Judge Saleh Abdullah Damoha. On 27th January defence counsel in the case asked the High Court to dismiss the charges because Zanzibar was not a sovereign state and therefore not prone to a military coup; Zanzibar had ceased to exist as an independent state in April 1964 following a merger with the then Tanganyika. Another defence counsel said the case was time-barred due to the prosecution’s failure to facilitate its hearing for over two years. The defence team also objected to an application for an adjournment to enable the new Attorney General to study the file. However, the case was then adjourned by the presiding Deputy Chief Judge Garba Tumaka who hails from Nigeria. President Amour had earlier made a conciliatory gesture. On January 12 he had announced that former Zanzibar Sultan Jainshid bin Abdallah bin Khalifa, who was overthrown in the revolution of 1964 and is now in exile in Britain, was free to return to the country (but not as King). When the case resumed on February 27 the prosecution accepted the defence argument that the charge sheet was faulty and promised to rectify it before the next session. The defence also succeeded in having two assessors whom they described as CCM zealots replaced. There was a lengthy debate on whether Zanzibar was a sovereign state and it was revealed, according to the Guardian, that the alleged treason took place between October 30 and November 28 1999. When the hearing was resumed again on April 3, Judge Tumaka, in a 60-minute address, rejected the defence argument that there was no case to answer. He said that Zanzibar was constitutionally a state and therefore the treason charges stood. The trial was to commence on May 2. Bail application was refused because treason charges were not ‘bailable’. After this judgement Seif Hamad and 11 others were charged with stealing a police firearm and causing grievous bodily harm to four police officers as they were trying to contain riots at a CUF rally. The case was expected to be in court on May 18. CUF Secretary General Seif Hamad was quoted in the Swahili press on April 3 as saying that his party would meet ‘force with force’. In the next elections it would be ‘an eye for an eye’ if CCM insisted on the current electoral commission running the elections in the same manner as in 1995. On April 18 he explained that his earlier statement did not relate to bloodshed as some people were thinking. It meant that CUF would not tolerate the injustice it suffered in the 1995 elections. Meanwhile parts of the press were complaining about CUF supporters behaving like hooligans after a reporter was beaten up. Tension on the streets increased further when the police engaged in an operation described by Minister of State Ali Ameir Mohamed as designed to ‘teach a lesson’ to people and politicians who refused to obey the police. The police were looking for weapons. Amongst the people arrested briefly was Mohamed Dedes, a member of the Inter-Party Commission set up under the Commonwealth-brokered agreement, who is also a CUF Central Committee member. At one or two CUF branches flags were reported to have been tom down and files destroyed and at one time the police fired into the air. Several people were said to have been injured. Isles Police Chief Khalid Nuizani stated that 60 people had been arrested altogether but they were young hooligans who had taken part in the disturbances. He said that there had been no special selection of suspects as claimed by CUF. In their strongest statement yet, the EU Heads of Mission in Dar es Salaam issued a statement on April 6 which was quoted in the Guardian and said that ‘Resolution of the conflicting situation in Zanzibar is a moral and political responsibility of the Union government. If the current situation in Zanzibar continues, this will have a negative impact on the international community’s perception of human rights, good governance and democracy in Tanzania’. In the same statement, issued by the Embassy of France, the EU expressed dismay at the outcome of the most recent development in the treason trial ‘We call upon the government of Zanzibar to immediately drop the charges and release the accused’. They expressed concern at the indications of failure of the Zanzibar government to prepare the way for a peaceful and fair election later this year; these included harassment of the opposition party, arbitrary and heavy -handed policing and the unwillingness to implement the Commonwealth-brokered agreement, particularly the rejection of the proposed reform of the Zanzibar Electoral Commission. They went on: ‘Considering both the issue of the treason trial and the issue of the agreement, the EU representatives are all of the opinion that there is a serious risk of further deterioration of the human rights and democracy situation in Zanzibar. We therefore appeal to all parties to show moderation and responsibility in resolving their differences -the government of the United Republic has a key role with regard to respect for human rights, governance and democracy, as well as responsibility for the police force in Zanzibar’ . Amnesty International sent out a report on April 12 under the heading ‘Widespread arbitrary beatings and arrests of opposition supporters’ . The press freedom watchdog Article 19 in a 30-page report entitled ‘Democracy on shaky foundations’ which was quoted in the East African, warned that Zanzibar’s democracy was in danger. President Mkapa, in a nationwide broadcast on April 10, called on the people not to heed politicians bent on creating conflicts in society. He said there was a hidden agenda among those who talked of violence and bloodshed and that leaders who threatened to shed blood would not be tolerated in Zanzibar. He was quoted in the East African as saying that the political problem in Zanzibar had had a negative effect on business, especially ferry boat operators and business between the mainland and Zanzibar, as fear spread to both islanders and mainlanders. He cautioned politicians against defaming their country and asked them to protect the national image and achievements. Zanzibar ministers stepped up their attacks on foreign involvement in the issue. Minister of State Ali Juma Shamhuna accused Dr Anafu of double standards. He had said one thing to CUF and another thing to Dr. Amour which made implementation of the accord difficult. Government spokesman Hafidh Ali was quoted in The East African as saying that as far as the trial was concerned it was a matter for the court. “Aren’t the people calling for the government to intervene the same people who call for independence of the courts? Why can’t they let the process go on freely and fairly in an independent court? If they want the case dropped they should talk to the concerned organs and not to the government”. Zanzibar Minister of State Mohammed Ramia said that CUF was always running to foreign embassies to feed them with lies. He said the problems of Zanzibar would not be solved by the Accord, the media or by the embassies alone. Deputy Chief Minister Omar Mapuri was quoted as saying that the problems of Zanzibar were that it was a young democracy and foreign embassies were interfering in the island’s internal affairs. CCM Secretary General Phillip Mangula issued a strongly worded statement on April 20 (quoted in the Guardian) -following a CCM Central Committee meeting in Zanzibar attended by President Mkapa -in which he accused the international community of being biased in favour of CUF. He warned western countries that they would have to share the blame if the ongoing unrest in the Isles ended in bloodshed. When CUF supporters issued statements like ‘an eye for an eye and a tooth for a tooth’ and mobilised their supporters to buy machetes, not a single word was uttered by the international community. This made CUF arrogant and endangered the understanding reached between the two parties. The Secretary General showed video tapes in which CUF leaders were telling the people that they were afraid neither of the police nor the judiciary. Meanwhile, in spite of the political problems, Zanzibar’s success in tourism continues. Tourism is now by far the fastest growing sector of the economy -100,000 tourists are expected to bring in $72 million this year compared with less than $2 million five years ago -East African. When Judge Joseph Warioba (at present acting as the assistant to former President Nelson Mandela as the Mediator in the Burundi peace talks) produced his monumental 521-page report on corruption in Tanzania in November 1996 it was widely recognized as one of the fmest and frankest of its kind. Expectations were high that something would be done about it. However, in early 1999, Transparency International was still describing Tanzania as 81st out of 85 countries (on a par with Nigeria) in its ‘Corruption Perception Index’. This was strongly contested by the government and there was later some retraction by Transparency International. Then Tanzanian Chief Justice Francis Nyalali said on his retirement on February 3 that: “Although it is illegal for civil servants to accumulate riches through dubious ways, those who breached this ethic in various institutions are still there and no meaningful action has been taken against them till this time”. The Chief Justice, who was the longest serving Chief Justice in the Commonwealth was referring to what he described the failure to bring to book the ‘big shots’ referred to in the Warioba report. He is succeeded by Justice Barnabas Samatta. However, President Mkapa’s government has been far from idle in dealing with corruption. In January he unveiled a ‘National Anti­corruption Strategy and Action Plan’. Earlier he had directed the Tanzania Revenue Authority (TRA) to provide to the public special free telephone numbers on which they could deliver the names of suspected tax evaders. He said that such people should not be forced to give their identity. “It is strange that a pick pocket who steals ShslOO is often chased and beaten up but a wealthy trader who steals by evading Shs 100 million in tax is glorified and safeguarded” he said. The President has also strengthened the Anti-Corruption Bureau and ensured that the TRA is a power in the land. Since he became President in 1995 two cabinet ministers named in the Warioba have been forcedto resign and hundreds of senior and junior civil servants have been sacked, transferred, demoted or otherwise punished follow allegations of corruption. Then, on December 28, and for the first time (the President has stated repeatedly that people can be arrested only if there is proof of their corruption) one of the so called ‘big shots’ was taken to court. Fonner Works Minister Nalaila Kiula together with his fonner Pennanent Secretary, his Director of Roads and Aerodromes, his Chief Engineer (Rural Roads) and the Director of a construction company appeared in a Dar es Salaam Magistrates Court to answer corruption charges involving the loss of Shs3.3 billion (TA No 65). When this case came up on March 21 defence council protested that investigations into the case had been going on for four years but were still not complete. The magistrate agreed to a further adjournment until April 18. In further measures against corruption the Daily News reported that the government had revoked the licenses of 11 and given notice of cancellation of 14 other oil marketing companies for failing to adhere to regulations governing the petroleum sector including massive tax evasion amounting to some Shs 60 billion per year. The relevant bank accounts were subsequently seized. An eye specialist at Muhimbili hospital was charged in court on charges of soliciting and receiving a bribe. The National Sports Council announced that any leader of a sports association involved in corruption would in future face a life ban. At the end of March the Deputy Commissioner of Customs said that there were over 300 containers in the port at Dar es Salaam of which 50 were waiting payment of taxes, 75 were the subject of tax disputes and 92 had not been claimed by importers. On March 20 the Guardian reported that the President had retired in the public interest the fonner Director of Mwanza Municipal Council even though, when he had been taken to court, the magistrate had ruled that there was insufficient evidence to prove the five charges against him. The charges were for being in possession of wealth (including three houses) reasonably suspected of having been corruptly acquired. A wildlife conservation scheme started by an American conservationist and a professional hunter has brought benefits worth more than £50,000 to 18 villages according to an article in the DAILY TELEGRAPH (January 3) which explained that, when Tanzania banned game hunting from 1973 to 1983, there was no one in the reserves to police them against poachers. Maswa District lost 15,000 animals a year and long lines of snares would cover every gap in the bush. Now, local people are paid £3 for each snare and much higher rewards for help in the arrest of armed poachers. Hunting clients are invited to pay up to £2,500 on top of their bills to benefit the villagers who accompany game rangers on anti­poaching patrols. Long-line snaring has become a thing of the past. In what the CHURCH TIMES recently described as possibly the largest wide span structure to be built by the local people, a new 20 x 45 metre cathedral is taking shape in Musoma -‘the fruit of a living link: between Tanzanian Christians and the congregation of st. John’s Church, Blackheath, London’. Last July 15 church members from Blackheath went to Musoma to help erect the first of the cathedral’s 11 seven-ton roof trusses. The arched Gothic window frames were made on site by gluing and clamping together 13 separate strips of wood (Thank you Ron and Liz Fennell for sending this item and the one above -Editor). Asha Mtwangi writing recently in the BBC’s FOCUS ON AFRICA featured Dar es Salaam’s informal trade sector: ‘There is no escaping it. Or, rather there is no escaping the machinga, the energetic young hawkers who have overrun the streets of Dar. Their talents are remarkable. They know the tastes of different kinds of potential customers. How about a sleek cordless telephone, or a handy self-wringing mop with bucket or a Rado 21 jewel watch for your girlfriend? …. the Ministry of Labour and Youth Development says that it has the interests of the machinga at heart and promises to make soft loans available … but the machinga are not interested. They get all the loans they need from the Indian merchants who lend them fancy merchandise; no financial hassles, no paperwork, no demands for collateral. Just trust and confidence in the machinga’s innate trading nous … .it certainly feels that the machinga are here to stay. The word has been extended to all petty businessmen. And that’s a tribute to the enterprise of the original machinga from the south of Tanzania’ . (Thank you Jane Carroll for sending this item Editor). A 16-page supplement on Arusha (‘Tanzania’s most endowed region’) in THE EAST AFRICAN (March 27) included an article pointing out that the region had the largest variety (50 different kinds) of minerals including the famed Tanzanite which represents 80% of the region’s gemstones exports. Other minerals mentioned included decorative stones like anyolite, crystalline marble, aventurine and amazonestone. Other minerals include high quality graphite, kyanite, limestone, and phosphates. ’11-year old Ledida, went with friends to draw water from a local water point. On their way back home a rogue hyena suddenly appeared and attacked the children mauling them in turn. The children’s screams and their attempts to ward off the hyena made the beast more aggressive. Ledida’s face was particularly badly mauled and she suffered fractured upper and lower jaws. She was taken to Loliondo Hospital which called the FLYING DOCTOR SERVICE for a mercy flight to Nairobi. During the journey her face was all bandaged up leaving only a breathing tube. Ledida will be in hospital for some time to undergo all the phases of re constructive surgery’. President Mkapa praised the willingness of the World Bank and the IMF to listen to Tanzania especially their willingness to be flexible with regard to the new thrust towards growth and broader-based poverty reduction. Speaking in Gabon on 19th January he said that Tanzania had, in the last few years, witnessed in a World Bank President, Jim Wolfensohn and IMF Managing Director Michel Camdessus, an unprecedented willingness to listen to Africa. EU Development and Human Affairs Commissioner Poul Nielson was quoted in South Africa’s BUSINESS DAY (March 3) as saying that Tanzania’s policies were hindering free trade in the region by unduly protecting domestic industry. “While the government’s commitment to the market economy is generally recognized it seems to be much less prepared to liberalize in the area of foreign trade” he said. He gave as examples Tanzania’s decision to pull out of COMESA and the fact that Tanzania was the most reluctant in the East African Community and in SADC to implement free trade protocols. Economists at the same event defended Tanzania saying that the country could not produce world class products due to poor infrastructure. Local manufacturers would be killed by free competition within the regions’ trading blocs they said (thank you David Leishman for sending this item -Editor). Anglogold, the world’s biggest gold producer has taken a 50 per cent joint venture stake in Ashanti Goldfield’s Geita project in Tanzania. This followed the serious financial situation affecting Ashanti after the sudden rise in the price of gold in late 1999. Anglogold is paying Ashanti $205 million in cash for the 50 percent share and will procure or provide project financing to the Geita project totalling $130 million. The Presidential Parastatal Reform Commission has been given four more years in which to divest l32 public corporations. 263 out of 395 corporations have been divested in the last six years. Those earmarked for early divestiture included TTCL, TANESCO, Air Tanzania, the National Microfinance Bank, the National fusurance Corporation and DA W ASA. The 6,000 depositors in the failed Greenland Bank in Dar es Salaam and Zanzibar are receiving back funds in their accounts which were frozen last year -Daily News. ‘Alliance Air’ was in danger of collapse as this issue of TA went to press. The South African parent company Transnet decided to pull out from April 7. The other shareholders -South African Airways, Uganda and Tanzania -were deciding what to do -East African. Tanzania’s 19th commercial bank will be Barclays which was licensed in January to resume operations in the country -East African. A Netherlands-assisted $423 million project for the widening to 140 m and the deepening from 7.0 m to 10.2 m of the entrance to Dar es Salaam Port has been completed. After one year of difficult negotiations and much popular opposition, the agreement under which 70% of the National Bank of Commerce has been taken over by the ABSA Group from South Africa was finally passed by parliament. A reduced sum of $18.75 million was paid to the Tanzanian Treasury by ABSA on March 30. Recent announcements on aid to Tanzania: CHINA -a loan of Shs 7 billion to TAZARA for equipment and spare parts for the Chinese-aided Tanzania-Zambia railway. LIBYA -assorted equipment including three tractors, an ambulance and medicine for Zanzibar. USA -$2.5 million to fight AIDS. FINLAND -Shs 3.1 billion for the Local Government Reform Programme and the National Forest Programme and Shs 1.2 billion for poverty eradication. SWITZERLAND -Shs 9 billion in budget support. KOREA -Shs 24 million for communication and agricultural equipment. The EU -Euros 42 million for roads in Mwanza and for tax administration; Euros 2 million over two years for training, equipment and support for the Prevention of Corruption Bureau’s public awareness campaigns and Euros 1.75 million for implementation of the Tourism Master Plan. JAPAN -Shs 66 billion for forestry in Lushoto district, Shs 3 billion in food aid (rice) and Shs 210 million for equipment for the Nattional Museum. DENMARK -Shs 1.7 billion for new transparent ballot boxes for the next elections.